Ronald Kumar lifts his guard as Rakuro Daunivanana comes in with his body punches at Tilak High School hall, Lautoka on April 14, 2018. Photo: Waisea Nasokia. Mulomulo Boxing Club’s Ronald Naidu escaped with a split points win over Rakuro Daunivanana in the main bout of the Kiran Boxing Promotions at Tilak High School hall, Lautoka last Saturday night. Daunivanana’s fitness coupled with his ringcraft saw him trouble Naidu at times. 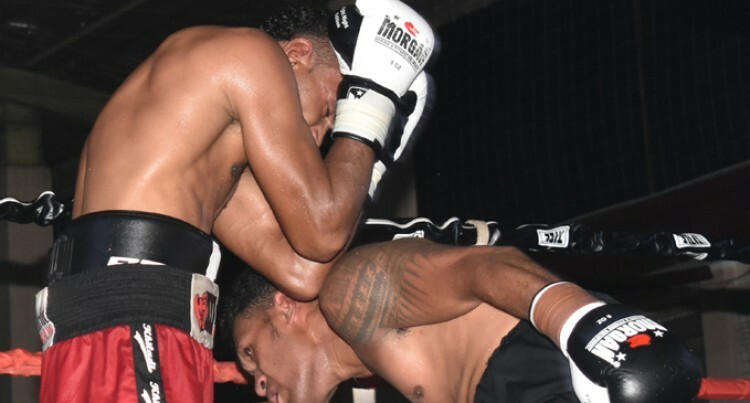 “It was a good fight as I only trained for two weeks,” the Nadi welterweight slugger said. However, the 21-year-old Daunivanana who hails from Buca village in Cakaudrove said he has accepted the judges decision. Supporting Bouts- Sachin Mudaliar SPD Ritesh Goundar, Rahul Aaron Kumar 2TKO Joseva Lomaion; 4×3 min- Felix Wiliame Chongsue TKO1 Saula Naicori, Jonasa Kavika TKO5 Rupeni Rasaku, James Singh RSC2 Esira Cagi. Women- Elenoa Mataniniga DREW Katrina Singh.